One of my favorite salads in the whole world is The Cobb Salad. Who can resist crisp greens, creamy avocado, tomatoes, eggs, scallions, bacon, and leftover chicken? I surely cannot. Did you know this famous salad originated in Hollywood, back in the 1920's? 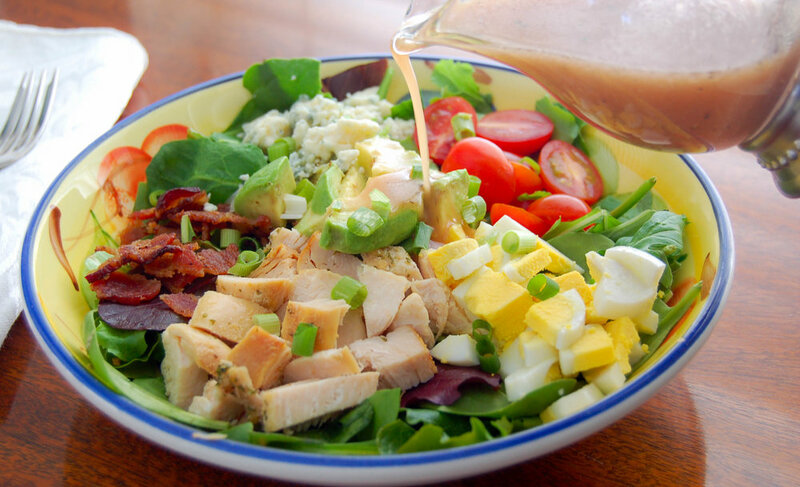 The Cobb Salad got its name from Robert Cobb, an owner of the once famous Brown Derby Restaurant in Los Angeles. To quote marriedatthemovies.com: “As the story goes, late one night, [Cobb] prepared himself a salad of chopped leftover chicken with some other ingredients. Four of his pals dropped by the restaurant after a movie preview, just as Bob was enjoying his homemade supper. One asked what he was eating, and that salad became known as Bob’s ‘Cobb Salad.’ When the Hollywood Brown Derby opened in 1929, The Cobb Salad, with its homemade Derby French Dressing appeared as an official fixture on the menu. To this day, the salad appears on menus throughout the country" (marriedatthemovies.com). For the full history and original recipe, check out marriedatthemovies.com. Now I feel privileged to eat such a prestigious salad! Our version is close to the original recipe, and surely one you will love. Another great line from marriedatthemovies.com: "At the Brown Derby, the Cobb Salad was presented to the guests with all the toppings lined up vertically over the salad greens, and tossed well with the Old Fashioned French Dressing, tableside." (www.marriedatthemovies.com). The original Derby French Dressing recipe, according to Sally Cobb, called for English mustard, but we substituted Cherchies® Champagne Mustard and added Cherchies® Garlic Seasoning to the mix. This recipe serves 6, but feel free to scale it down to your liking. We would love to hear your comments on this recipe and as always thank you for visiting our blog! Enjoy! Prepare the salad dressing. Add the salad dressing ingredients to a jar with a lid. Tightly close the lid and shake the ingredients until combined. Set aside. Arrange the lettuce on a large platter. As true to the original recipe, except for the green onions, place all the ingredients vertically over the salad. We opted to arrange the ingredients in a star shape. Garnish with the green onions and serve with The Brown Derby French Dressing. Toss. Visit Cherchies's profile on Pinterest.